Nehassaiu deGannes and Sam Mossler in Other People's Money. How many times have you seen a show where the villain of the piece is more engaging than the hero? It happens fairly often, as in the case of Florida Studio Theatre’s current production of Jerry Sterner’s Other People’s Money. Longtime Sarasotans may remember an Asolo Rep production of the play back in the early 1990s, or perhaps some recall the film version starring Danny DeVito and Gregory Peck. Since it’s about Wall Street shenanigans, a greedy investor “shark” and the sorry ending that has happened time after time with businesses that fall to predators, it’s a tale that can seem both timeless and of a specific era—in this case, a period when desks still held Rolodexes, corded phones and antiquated computers, as in Isabel and Moriah Curley-Clay’s set design. We’re also taken back to the late 1980s by Thom Korp’s sound design, which offers a flashback of old Michael Jackson and Huey Lewis tunes before the curtain ever rises. Once it does, William Coles (Joe Ditmars) begins to relate the story of the Rhode Island wire and cable company run by old-time good guy Andrew Jorgenson (Colin Lane), with the loving support of his assistant, Bea Sullivan (Perri Gaffney). He needs her support—and that of her lawyer-daughter Kate (Nehassaiu deGannes)—more than ever when Larry the Liquidator (Sam Mossler) starts circling the company, buying up shares prior to taking it over. At first, Jorgenson, or Jorgy, doesn’t see Larry as a threat; after all, shares are going up in value, so he’s willing to play along. Coles and Kate are quicker to catch on to Larry’s scheme, but the question is, will Larry prevail, or will the honest, dedicated man who’s willing to do anything to protect his employees? If you don’t see the answer coming, you’ve had your head under a rock for the last couple of decades. But there is still fun to be had in Sterner’s comedy-drama, especially as we watch Kate and Larry spar. You may even feel a bit of sympathy for Coles, torn between loyalty to his employer and looking out for his own financial future. Lane is likable enough as Jorgy; his dialogue delivery is a bit uncertain in the first act (and he, like deGannes and Gaffney, doesn’t always convince with his New England accent). He rises to the occasion in the second half, when he’s forced to do battle and deliver an impassioned speech to his shareholders. 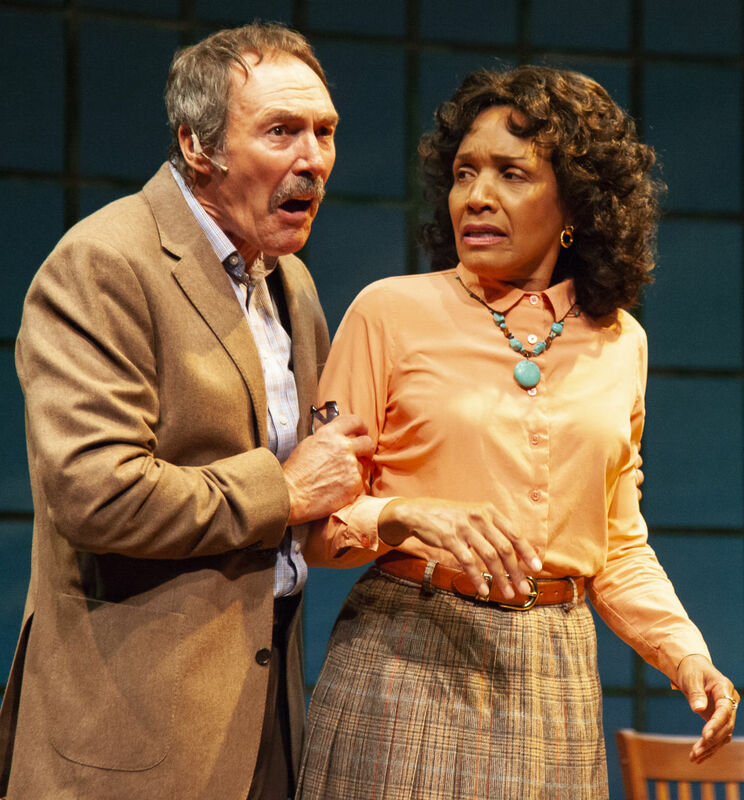 The show belongs to Mossler as Larry, though—he provides the juice that keeps the show compelling, steadily entertaining in his own crude but self-aware way and getting the lion’s share of the play’s best lines. His sexism, bad enough for the period in which the play is set, makes you even more uncomfortable now in the wake of the #MeToo movement, but he’s an undeniable life force. And Mossler, wearing the inevitable gold wristwatch and pinky ring, has great fun playing him. Director Jason Cannon keeps the scene shifts moving smoothly along, but perhaps Other People’s Money just can’t have quite the impact it did when it first took the stage. It all feels a very familiar story today. 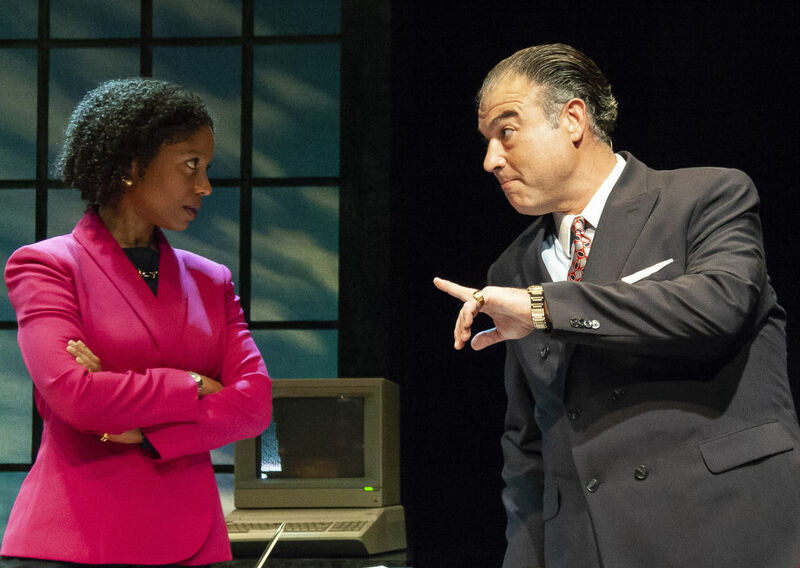 Other People’s Money continues through Aug. 26 in the Gompertz Theatre. For tickets call 366-9000 or visit floridastudiotheatre.org.